SEOUL, Sept. 12 (Yonhap) — South Korea’s auto exports increased in August from a year earlier on strong demand by new SUVs released by major automakers, government data showed Wednesday. Total exports reached 174,869 units worth US$2.85 billion last month, up 2.1 percent compared with the previous year, according to the data compiled by the Ministry of Trade, Industry and Energy. 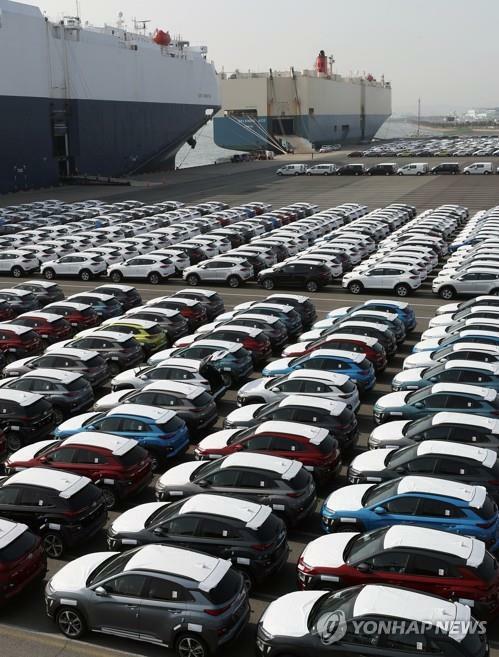 Shipments to North America, one of South Korea’s main auto markets, remained at the same level from a year earlier, and sales in the European Union, the second-largest market, dropped a sharp 25.7 percent. In contrast, auto sales in non-EU member states and Asia surged over 32.4 percent and 36.1 percent, respectively. The number of cars produced in the nation also rose a solid 8.1 percent on-year to 296,471 in August as industry leaders concluded labor agreements without major strikes. Outbound shipments of auto parts inched up 0.5 percent to $1.87 billion, led by upbeat sales in the United States and non-EU member states. Domestic sales of vehicles gained 5 percent to 146,086 units last month on a consumption tax break and release of new SUV models by Hyundai Motor and Kia Motors. Sales of locally produced cars climbed 4.1 percent to 125,289 units, while those of foreign brands jumped 11.2 percent to 22,797 as German luxury cars continued to gain popularity among Korean consumers.